I stumbled upon the perfect Thanksgiving Day post. You may recall my father remarried in June. My mother had passed away in 2008 and I was happy to see him find someone to share his last years with - someone that I like. And here we are at Thanksgiving with an expanded family. It’s always just been my father, mother, brother, nephew, and me, with the last few years with my mom in the nursing home. Our holidays were quiet and small. Now I’m in my 40’s and suddenly have two new stepbrothers with their children and grandchildren. We will have 17 for Thanksgiving today. Yowza! Betty has moved into my father’s home and this weekend is having her sons help her reorganize the garage. Once in a while I get an inquiry - “Do you want to keep this?” The nativity set is a no brainer - yes. Then came a surprise. 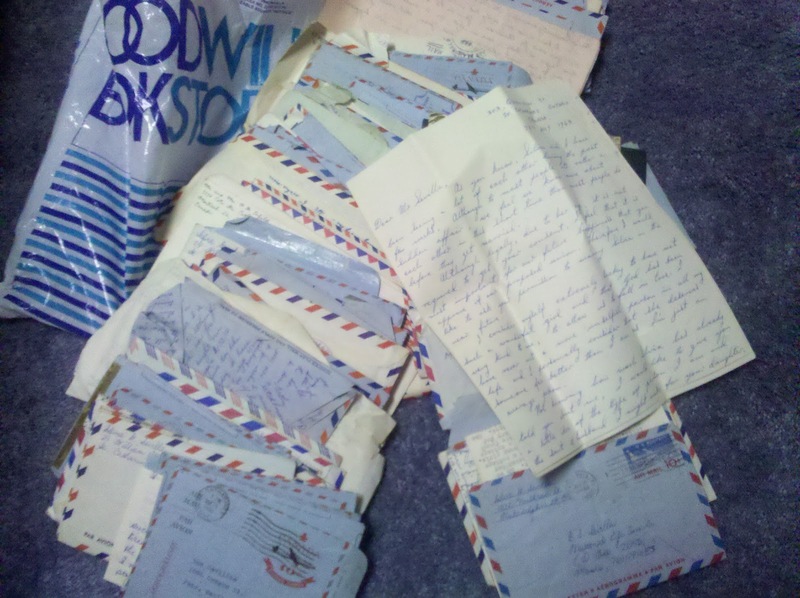 A plastic bag filled with letters from my mom to her family in the Philippines dating from 1953-1967. Crucial family history as that is the span when my parents met, married, had me, and eventually my brother. Curious how the keepsake letters stop at 1967 after Paul. I think there are more letters somewhere that are the Arabia years. Then, in fact, my mother had also kept my letters home from boarding school and college which I also have. For now, these are a new found treasure trove. In this day of technology, email, Skype, and Youtube, it is always interesting to stumble upon old letters. I’ve come across a few important ones to share. 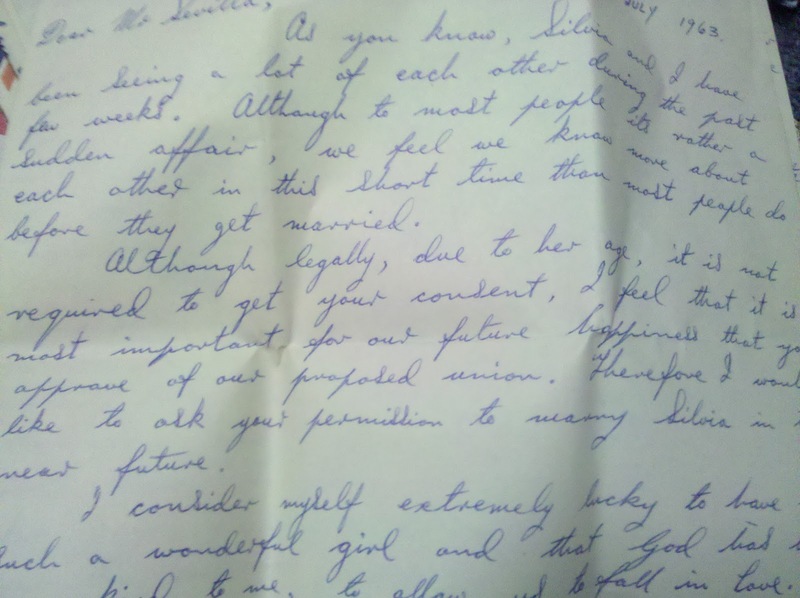 There are over 20 years from 1963 alone, mostly because mom is writing to tell her folks about her new guy she’s dating and then eventually the plan to get married. From what I can tell, they met in June. The request to marry is the beginning of August. The wedding took place in October. That fast. Mom always said she knew instantly and I’ve heard the story. She worked as a phlebotomist at a hospital in St. Catharines in Ontario (my namesake). My dad worked nearby and would go to the hospital cafeteria for lunch. He would see my mother there. According to the letters, she was sitting with friends near the cash register and so as he passed by he snuck a look at her nametag and then had a friend arrange their first date. For my mother it was blind date. This is all written in the letter the morning after their first date. My dad told me last night that mom never dated anyone else. This sort of concerns me. Most of us know today that relationships are full force at the beginning during the honeymoon phase and then settle down and change as time goes on. But back in the day I guess they thought love was a one shot deal. Seems so naive to me now, considering how many relationships and a few broken hearts I've had. I have a lot more to read through. I just picked dates I knew would be significant to start with. I'll read through them and then give them to my brother to hold on to. He is the one who is continuing the family through my nephew and possible future children. The letters were a treat, though, on a family Thanksgiving, ensuring that mom stays in our thoughts.